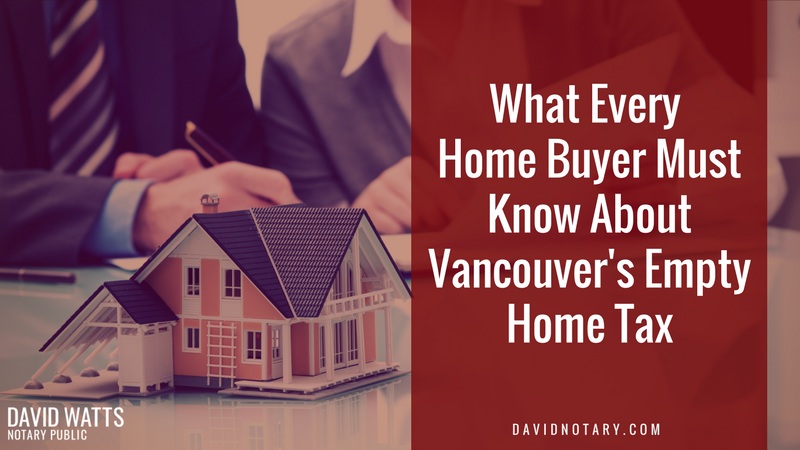 If you are buying a house the Vancouver’s Empty Home Tax may unexpectedly apply to you. Last year after the Vancouver City Council passed the controversial Empty Home Tax By-Law, dozens of homeowners and buyers have come to my office asking about the whether it applied to them. 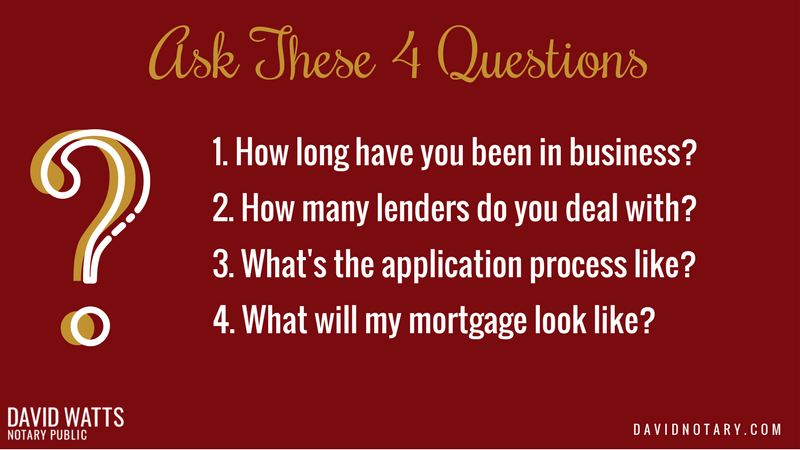 And the answer is not always clear, which can be particularly unsettling at the time of a real estate transfer. The new home buyer may be unknowingly responsible for paying a $10,000+ tax up to 2 years into the future. Ouch! In this guide, we explain the Empty Home Tax in simple English, so that all homeowners and buyers understand what it is and whether it applies to them. We also outline a solution that ensures no home buyer is caught with an unexpected tax up to 2 years after they purchased a house. Has not been rented out for 30 or more consecutive days). 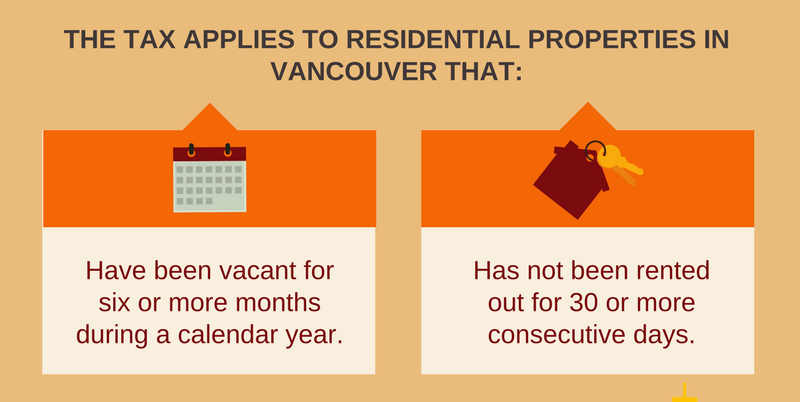 To help relieve pressure on Vancouver’s rental housing market, given low rental vacancy rates and high rental costs. The bylaw was passed tax in December of 2016, in a context in which rental prices were soaring, and more than 25,000 properties within the city remained empty or under-occupied. The tax looks to incentivize rentals, and the net revenues from the Empty Homes Tax will be reinvested into affordable housing initiatives in order to continue providing solutions to Vancouver’s housing affordability crisis. 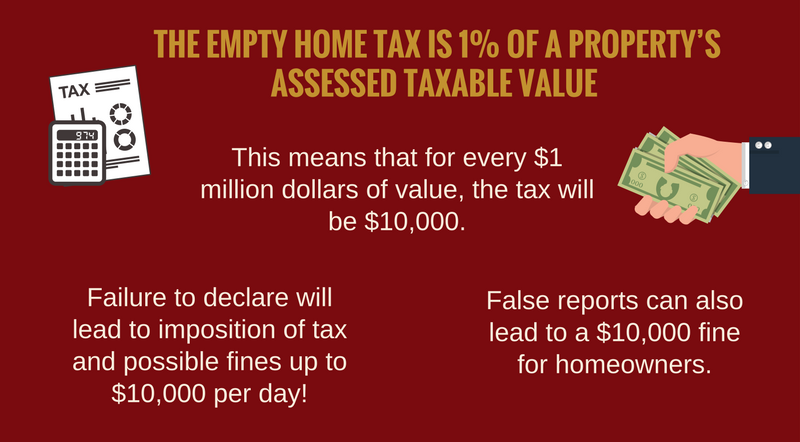 The rate of the Empty Home Tax is 1% of a property’s assessed taxable value. This means that for every $1 million dollars of value, the tax will be $10,000. The Empty Home Tax will be applied annually, with the first tax year beginning on January 1, 2017. It will be calculated each year based on the property’s assessed taxable value in the previous tax year. Who Does The Empty Homes Tax Apply To? Any non-principal residences within the City of Vancouver that is left empty for six months of the year or longer will have to pay the Empty Homes Tax. If your property is located in a municipality that does not fall within the city, such as the University Endowment Lands, Burnaby or Surrey, the tax will not apply to you. If your property is within the boundaries of the city of Vancouver but is not solely classed as a Class 1 Residential property, the Empty Homes Tax will not apply and you are not required to make an annual property status declaration. Were not principal residences, but were occupied for at least 180 days of the year because you worked in the city of Vancouver. The owner or the tenant was receiving long-term, inpatient, medical, or supportive care. The registered owner was deceased and a grant of probate or administration of the estate was pending. Are under a court order, court proceedings, or an order of a governmental authority prohibiting occupancy. How Will The Tax Be Implemented? 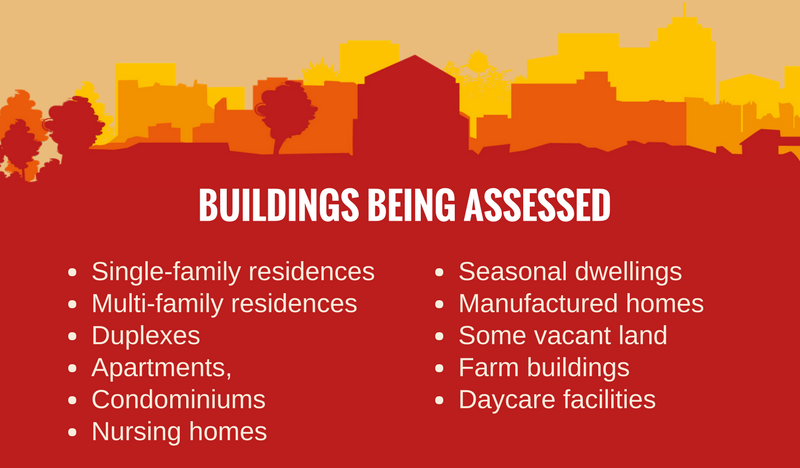 Every year homeowners in the City of Vancouver will need to make an annual property status declaration. This will include the valuation of the property and will state whether or not the property was vacant for six months or more during the previous fiscal year. The declaration will then be used to determine whether or not the property will be taxed. All declarations for the 2017 fiscal year must be made between December 1, 2017, and February 2, 2018. Failure to do so will lead to the imposition of the tax, as well as a fine that may reach up to $10,000 per day of non-compliance. False reports can also lead to a $10,000 fine for homeowners. This means that homeowners should definitely comply with the law, and be truthful in their declarations. Will Unpaid Taxes Be Transferred to a New Buyer? Buyers may have to pay taxes owed on a property after they purchase it. According to the bylaw, if you purchase or inherit a property that has unpaid Empty Homes Tax, you will not have to pay the one percent tax for that fiscal year. If it is found that it should have applied to previous years; that tax will be added to the property tax account associated with that property and “run with the land”. However, you’ll still have to present an annual property status declaration. An Audit for the previous year could take place 1-2 years after your home purchase completes. Even if you know that the Seller lived there, it may be impossible to find them to sign an affidavit and provide the evidence required. This could be problematic. We have seen several times were relations between buyer and seller are strained during the property transaction and negotiations. How do you know they will cooperate with an audit? As BC Notaries we are asked to provide our final report that the buyer owns the property free and clear of previous incumbents. This is a new challenge in how we can now do that under the cloud of empty homes tax as the audit time is in the future and the tax liability stays with the homeowner. The penalty goes with to the individual (previous owner) but the tax if unpaid goes with the land. Neither the City of Vancouver nor the real estate (salesperson and legal) community has done a great job at finding a convention on how we can deal with this. With every real estate transaction, there is potential that people are arguing about the Empty Homes Tax. This is an evolving area without a set generally accepted legal industry practice. To protect buyer’s, we have a few new steps for City of Vancouver Purchasers. Ensure that declarations are made and tax paid or held back until declaration made. Where the contract is silent on who is going to deal with the issue about Empty Homes Tax, we need to find something that has certainty. We have worked with the title insurance companies to confirm protection and most title insurance policies will protect buyers and lenders from the result of an unfavourable audit for previous year’s declarations. The cost of title insurance depends on the price of the property. Here is a Policy Calculator for Stewart Title. Cost and coverage between title insurance companies are about the same. While title insurance is an increased cost, we can find something that delivers certainty as well as providing protection on several other areas as well. We urge all buyers to now purchase “owner policy” title insurance. Many Lenders already insist on getting title insurance to cover the mortgage. The Empty Homes Tax isn’t mentioned in the contracts of purchase and we receive. We can’t have variables. 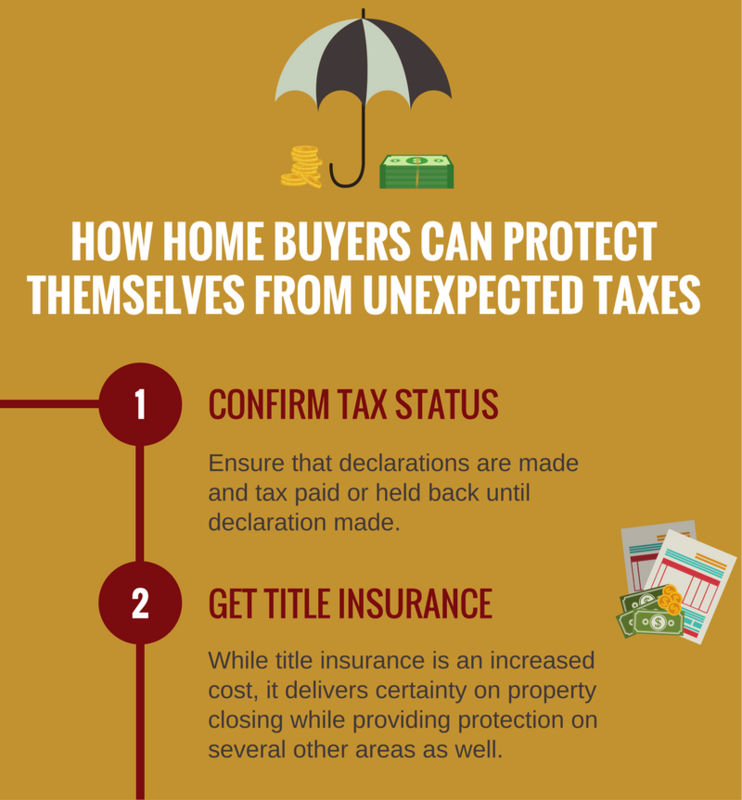 We urge our purchaser’s to follow our advice and purchase owner’s policy title insurance. 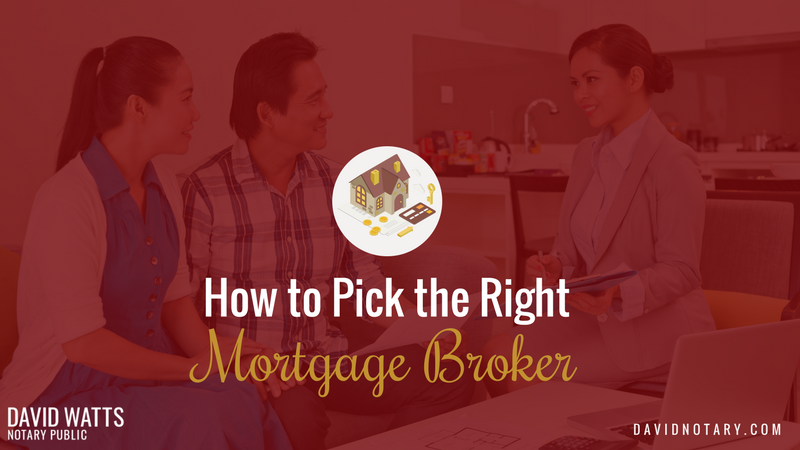 Purchasers do have a choice and our clients can refuse to buy title insurance. In such cases, we will provide a Waiver if to confirm the risk lies solely with the purchaser. They agree we accept no liability around unpaid taxes or risks that would have been covered by title insurance. If you still have questions regarding the Empty Home Tax and for more information about buying real estate in the City of Vancouver, please call or email us. We are happy to assist you directly or to provide a referral to a notary or lawyer in your area. After the Vancouver City Council passed the controversial Empty Home Tax By-Law, dozens of homeowners and buyers have come to my office asking about the whether it applied to them. We’ve created this handy infographic that will help explain the Empty Home Tax. It also details how to overcome the biggest risk to home buyers – getting hit with a $10,000+ tax from before they owned the property. For a more detailed explanation of the Empty Home Tax, see this post.